The range of Lady Ross's Turaco is Central Africa (Angola, Zambia, Kenya, Cameroons, Central Africa Republic, etc.). 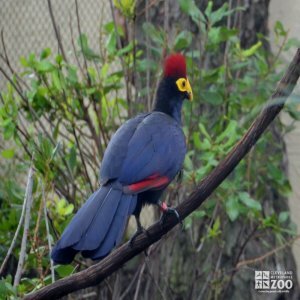 Lady Ross's Turaco's tend to be in pairs or small flocks. Tends to be sedentary, cannot fly very well. Spends its time running around trees inconspicuously and silently. The only time they seem to be around is their hoarse “caw” cry. Both sexes of Lady Ross's Turacos build a nest of twigs in trees at least 8 or more feet above the ground. The breeding season varies by country, but tends to be fall. The chicks grow fast and by 30 days leave the nest trees supervised by their parents.